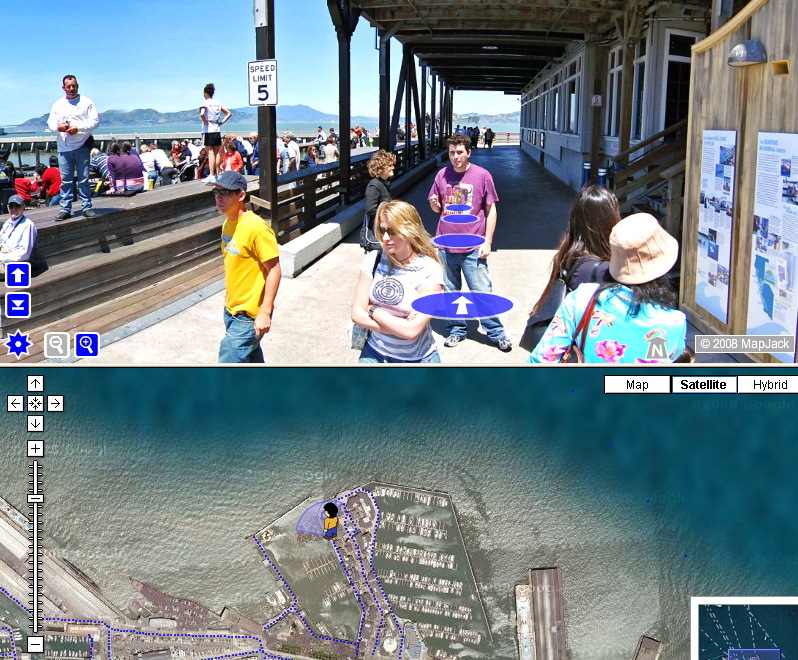 Walking Pier 39 with MapJack. Going where no cars have gone before. I know its research tuesday and I will post a few interesting reads from McGonigal and SSRN a little later on but for now more MapJack goodness. You thought you were alone walking along San Fran’s Pier 39 on a sunny day about year ago. Did you notice someone with a weird camera pack? Well apparently they noticed you. True to its marketing statements MapJack has mapped a number of pedestrian only walk-ways and judging by peoples faces their camera rig must have really stood out. What others have done with NASA budgets and Star Wars-like equipment, we’ve done on a shoestring budget, along with a few trips to Radio Shack. This is by far one of the coolest privacy invading uses of technology I’ve seen in a while. I cant wait till they map central park, so many “quickies” in the park to be captured for the world to see, so little time. Beware, if you have even the slightest voyeuristic tendencies the following service/site from Google is going to be addictive. Google Streetview launched back in May and has made the privacy wonks apoplectic. With good reason, theres lots of negative privacy implications to Google Streetview, there’s already been an incident involving a not so secret coffee break and an overzealous HR manager. However, the sheer voyeuristic goodness of Google’s Streetview more then offsets the obvious assault on our privacy. Besides, Google promises to do no evil and they are the only search engine that said no to the US government when it tried to get their search records. Of course, if the folks in Washington werent such Luddites they would know that they could get the same information by simply doing a Google search. To check out hte funniest links found on Google Streetview you should check out Streetview Gallery, Streetviewr.com and Map Mole.